Washington (CNN) - If it wasn't already clear that Mitt Romney and his allies are trying to lower expectations heading into next Wednesday's debate against President Obama in Denver, the campaign is now making it official. In a memo about the debates distributed to campaign surrogates and provided to CNN on Thursday, longtime Romney adviser Beth Myers outlines a series of reasons why the president is likely to emerge as the winner of the first debate. - President Obama is "widely regarded as one of the most talented political communicators in modern history." - "This will be the eighth one-on-one presidential debate of his political career. 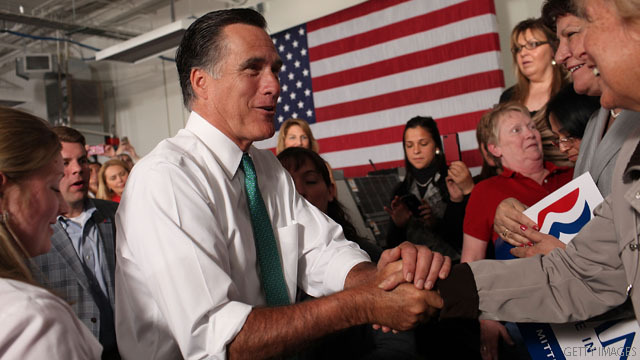 For Mitt Romney, it will be his first." - "Four years ago, Barack Obama faced John McCain on the debate stage. According to Gallup, voters judged him the winner of each debate by double-digit margins, and their polling showed he won one debate by an astounding 33-point margin." Myers argues that Obama will "use his ample rhetorical gifts and debating experience to one end: attacking Mitt Romney." "We fully expect a 90-minute attack ad aimed at tearing down his opponent," she writes in the memo. Pushing back against emerging conventional wisdom, Myers concludes that the debates will not, in fact, decide the election: "It will be decided by the American people," she says. In a matter of days, Governor Romney and President Obama will meet on the presidential debate stage. President Obama is a universally-acclaimed public speaker and has substantial debate experience under his belt. However, the record he's compiled over the last four years – higher unemployment, lower incomes, rising energy costs, and a national debt spiraling out of control – means this will be a close election right up to November 6th. Between now and then, President Obama and Governor Romney will debate three times. While Governor Romney has the issues and the facts on his side, President Obama enters these contests with a significant advantage on a number of fronts. Voters already believe – by a 25-point margin – that President Obama is likely to do a better job in these debates. Given President Obama's natural gifts and extensive seasoning under the bright lights of the debate stage, this is unsurprising. President Obama is a uniquely gifted speaker, and is widely regarded as one of the most talented political communicators in modern history. This will be the eighth one-on-one presidential debate of his political career. For Mitt Romney, it will be his first. Four years ago, Barack Obama faced John McCain on the debate stage. According to Gallup, voters judged him the winner of each debate by double-digit margins, and their polling showed he won one debate by an astounding 33-point margin. In the 2008 primary, he faced Hillary Clinton, another formidable opponent – debating her one-on-one numerous times and coming out ahead. The takeaway? Not only has President Obama gained valuable experience in these debates, he also won them comfortably. But what must President Obama overcome? His record. Based on the campaign he's run so far, it's clear that President Obama will use his ample rhetorical gifts and debating experience to one end: attacking Mitt Romney. Since he won't – and can't – talk about his record, he'll talk about Mitt Romney. We fully expect a 90-minute attack ad aimed at tearing down his opponent. If President Obama is as negative as we expect, he will have missed an opportunity to let the American people know his vision for the next four years and the policies he'd pursue. That's not an opportunity Mitt Romney will pass up. He will talk about the big choice in this election – the choice between President Obama's government-centric vision and Mitt Romney's vision for an opportunity society with more jobs, higher take-home pay, a better-educated workforce, and millions of Americans lifted out of poverty into the middle class. This election will not be decided by the debates, however. It will be decided by the American people. Regardless of who comes out on top in these debates, they know we can't afford another four years like the last four years. And they will ultimately choose a better future by electing Mitt Romney to be our next president. Chick, chick, chick, chick. Here chick-a-dee, here. Willard is a chicken and this is too funny for words. Obama has said that he hasn't seen any victims on the campaign trail. Then why is he shelling out so much tax payer money for all those non-victims? Pandering for votes? These debates will NOT be worth watching as the only man qualified to be president (Gary Johnson) will not be allowed to debate. If the American people were allowed to hear what Gary Johnson had to say he would win this election easily as he represents the majority of people in this country! But the corrupt two party system will NEVER allow that to happen! And because of that the American people LOSE! Not sure anythng the "great orator" can say to make me believe he's won any debate. So many fools out there voting for stupid scratching my head has left me completely bald. I will watch, I will vote for anybody but Obama, I will feel good about myself in the morning.